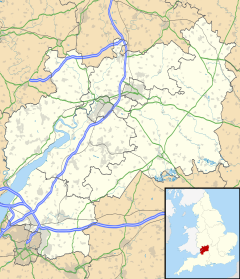 Broadwell is a village and civil parish in the English county of Gloucestershire. It is about 1.5 miles (2.4 km) north of Stow-on-the-Wold, In the 2001 United Kingdom census, the parish had a population of 384. decreasing to 355 at the 2011 census. The Church of England parish church of Saint Paul was built in the 12th and 13th centuries and restored in the 1860s. Broadwell is governed locally by a parish council. The civil parish is part of the ward of Fosseridge. As of 2012[update] the ward is represented on the Cotswold District Council by Conservative politician Julian Beale. The village is represented in the House of Commons of the Parliament of the United Kingdom as part of The Cotswolds. It elects one MP by the first past the post system of election. Since its creation for the 1997 general election, The Cotswolds (formerly known as Cotswold) has been represented at Parliament by Conservative MP Geoffrey Clifton-Brown. Prior to 1997, Broadwell was part of the constituency of Cirencester and Tewkesbury. The village is also part of the South West England constituency of the European Parliament. At the 2001 UK census, the civil parish of Broadwell had a population of 384. The 2001 population density for the ward of Fosseridge was 0.29 per hectare, with a 100 to 88.6 female-to-male ratio. The proportion of residents who classified themselves as White was 99.2%, a figure higher than those for Cotswold (98.8%), the South West (97.7%) and England (90.9%). ^ "Parish population 2011". Retrieved 24 March 2015. The geographic coordinates are from the Ordnance Survey. Verey, David (1970). The Buildings of England: Gloucestershire: The Cotswolds. Harmondsworth: Penguin Books. pp. 136–137. ISBN 0-14-071040-X. 'Parishes: Broadwell', A History of the County of Gloucester: volume 6 (1965), pp. 49-59. This page was last edited on 13 November 2018, at 00:52 (UTC).